Our price: $240 - save $30! This box set of VINYL LPs (including digital download code) was released on May 18, 2018, and is in stock now. Plus: all orders will include a FREE bonus set of Jersey Shore coasters (see below), exclusively from Backstreets, just an extra something to say thanks for ordering from us. On May 18th, Columbia Records/Legacy Recordings will release Bruce Springsteen: The Album Collection Vol. 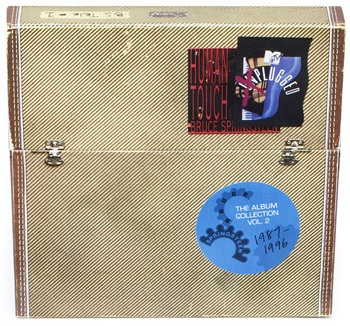 2, 1987-1996, a limited-edition, numbered boxed set comprised of material recorded and released by Springsteen for Columbia Records during that period. The long out-of- print LPs are available remastered for the first time on vinyl. 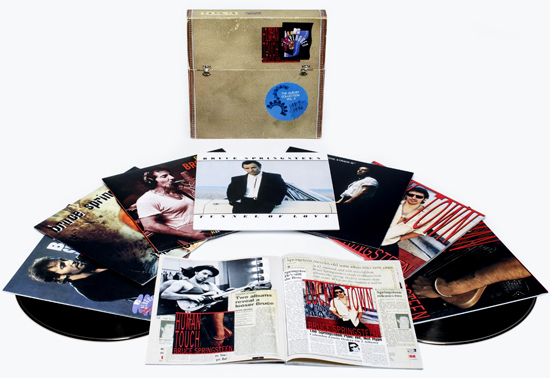 In addition to Springsteen's four studio albums from the era, the boxed set includes a special 12-inch of 1988's live EP Chimes of Freedom, Springsteen's 1993 two- LP MTV Plugged special, and the first-ever vinyl release of the 1996 Blood Brothers EP for a total of 10 discs. All of this material comes in recreations of the original packaging, accompanied by a 60-page book featuring rarely seen photos, memorabilia and original press clippings from the period. For The Album Collection Vol. 2, remastered albums from acclaimed engineer Bob Ludwig and Springsteen's longtime engineer Toby Scott have been pressed on vinyl for the first time. The albums were transferred from the original analogue masters using the Plangent Process playback system. 1987's Tunnel of Love and 1992's Human Touch have also been expanded across two LPs to maximize audio quality. The Vol. 2 collection follows the 2014 release of The Album Collection Vol. 1, 1973-1984, which included newly remastered editions of the first seven Bruce Springsteen studio albums. BACKSTREETS EXCLUSIVE: Every copy of this box set will come with this free set of four beverage coasters, just the thing as you pour yourself a drink and sit down to experience the new sound on your favorite records. This is a set of four new designs, to expand the set we give away with The Album Collection Vol. 1 1973-1984. Collect 'em all! 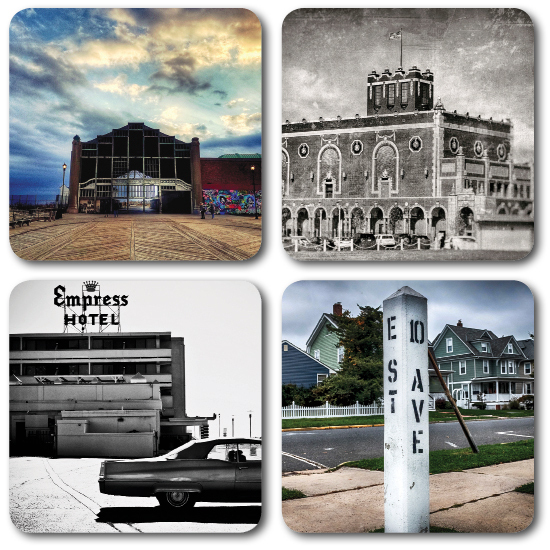 These four new Jersey Shore scenes from photographer Mark Krajnak include the Casino on the Asbury Park boardwalk (where Springsteen shot the 'Tunnel of Love' video), the Paramount Theatre (home to three landmark 1996 shows on the Tom Joad tour), and, of course, a crossroads for the E Street Band. Only from Backstreets, and only as a bonus item when you order Bruce Springsteen: The Album Collection Vol. 2 1987-1996.